Surveillance System is one of the upcoming topics in Health Care Sector. In this presentation, facial recognition for access control, Video analytics and monitoring for security and healthcare video surveillance applications will be covered. Through the sharing of some successful cases, you can have a comprehensive understanding to the Surveillance System. Mr. Wong Hin Fu is specialize for professional surveillance solutions, he has more than 15 years experience for providing professional consultation service for sizable projects in difference sectors. Telemedicine plays an important role in Medical Education. The use of video in Telemedicine is common. Although the use of video technologies is most helpful, it is always a great challenge to ensure the transmission of high-quality moving images due to the limitation of network bandwidth and the quality of service. In this seminar, we will share our cases on doing Telemedicine. We will illustrate the difficulties and the trends on Telemedicine. Mr. Albert Au, M.Sc. M.Phil. MIET is Senior I.T. Manager in the Faculty of Medicine, The University of Hong Kong. He graduated at the University of Warwick in United Kingdom in 1994 and the City University of Hong Kong in 1997. His research interest was in the field of digital image processing. He has been working for the Faculty of Medicine since 1996. He has more than 10 years experience on telemedicine. Microwave, free space optics, fibre optics, and internet were adopted and various video technologies were used in doing telemedicine. Currently, Mr. Au leads a team to provide technical support for the Faculty of Medicine and the Laboratory Animal Unit. Deadline for registration is 15 July 2015. 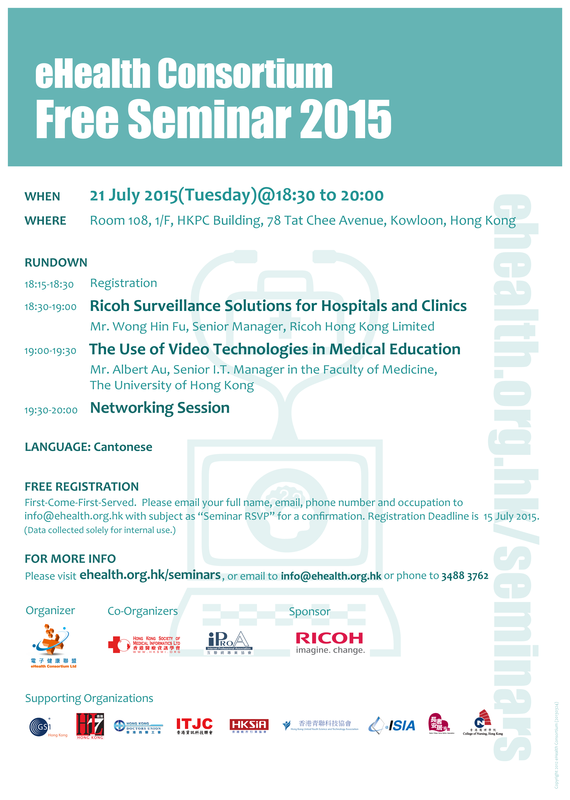 (Updated on 22 June 2015) Stay tuned for information on our next seminar!